The Sin City Swing put on an impressive offensive display in the 2014 PCBL Spring Wood Bat Championship game v. The Dragons, played on a beautiful night at Birmingham High School. This was the 5th meeting of the year for the two teams, with each team winning twice. Sin City didn’t waste any time getting their bats rolling, as they scored 5 runs in the top of the 1st, and never looked back, winning easily by a score of 13-3. This makes back-to-back wood bat championships for “The Swing”. 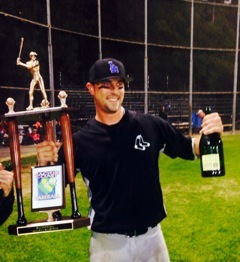 Leadoff hitter, Jacob Risinger, was one of the many offensive leaders for Sin City. He collected a couple of hits, including an inside-the-park home run to cap off the scoring in the 9th inning. Risinger finished with a team high 3 RBI. Kenny Lawson reached base 4 times, including 2 doubles. Former CSUN Baseball player, Mike McNeely, had a game high 3 hits, including a 2-out RBI single to extend Sin City’s lead to 6-0 in the top of the 2nd. Lorenzo Ramos, Luis Rivas, Miguel Alvarez, and Jose Morales also added 2 hits apiece, including Rivas’s mammoth solo home run to left in the 8th inning. 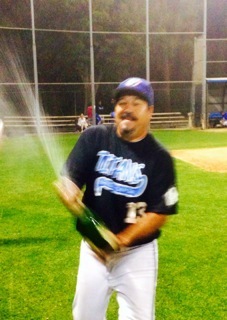 With his team being spotted an early 5-run lead, pitcher Eddie Mercado (Game MVP) was masterful. He scattered 10 hits, allowing only 2 earned runs in the complete game. With only striking out 2 Dragon hitters, Eddie gave most the credit to his defense. The Dragons did muster up a few key offensive players. Richard Lizarraga led the way going 3-3 with an RBI and Stan Spancer added 2 hits. The Dragons were held scoreless by Mercado until Bobbo Marcial scored from 1st base on a single by Luciano Aguirre in the 8th inning. 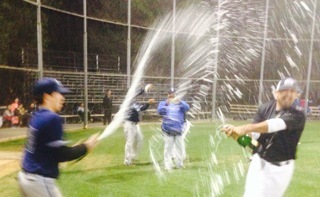 Sin City Coach, Justin Urbas, said this about is teams performance, “we played well tonight. The Dragons are a great team, and we know each other well. I have no doubt they will comeback at us next season”. 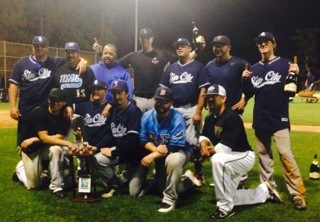 Congratulations to Sin City Swing ... PCBL 2014 Spring Wood Bat Champions!